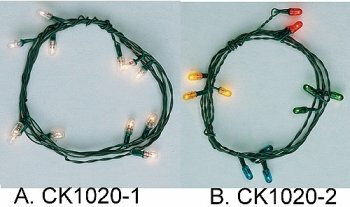 The CK1020-1 and -2 twelve-bulb light strings have their GOR bulbs spaced at 1" intervals giving a lighted length of 12". Two 12" green lead wires allow connection to power anywhere within the Christmas Tree room. Construction of the string is such that the first bulb can be placed atop the tree with the remainder wound in concentric circles toward the bottom. Overall length is approximately 24".